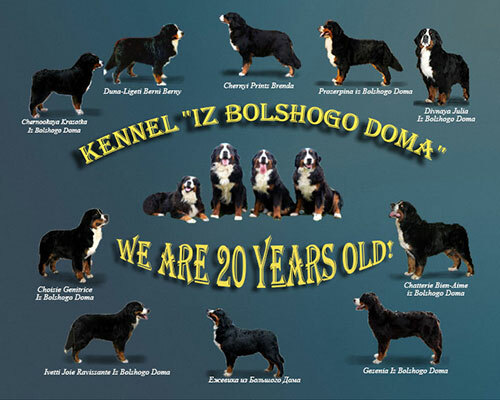 Bernese Mountain Dog Kennel "Iz Bolshogo Doma"
Our kennel "Iz Bolshogo Doma" is translated into English "From the Big House"
1994 - the beginning of our fascination Bernese Mountain Dog. It was then bought in Hungary, one of the founders of the Russian branch of Bern - Duna-Ligeti Berni Berny. He became our first Champion of Russia, Club Champion, Grand Champion of Russia. In virtually every distinguished pedigree Bernese Mountain Dog, who was born in Russia, you can find his name. Show career of many Mountain Dog "Iz Bolshogo Doma" quite successful. By 2015, we have 10 interchampions, many candidates interchampions and champions of both Russia and other countries. We pay great attention to the health of dogs. Be sure to carry out tests for hip dysplasia and elbow joints, as well as the necessary vaccinations. Bernese Mountain Dog - a real family dog​​. 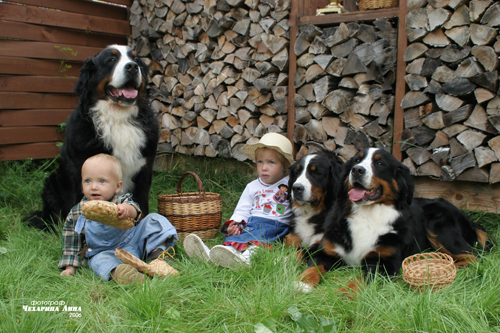 So on our site you will find lots of information about Bernese Mountain Dog, as a companion. Bernese Mountain Dog - it's a beautiful tri-color, loyal, loving family friend! Let the dogs of this breed bring joy to everyone who gets them!